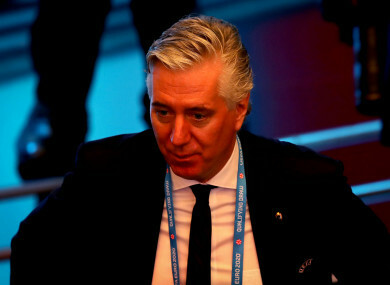 John Delaney, pictured at the Euro 2020 qualifying draw last December. THE FAI YESTERDAY relaunched their ‘Club Ireland’ premium ticketing scheme, although it was announced beneath the lingering shadow of the botched plan of 2008. Back then it was known as the Vantage Club, which sold premium seats in a price ranging from €12,000 for seats behind the goal to €32,000 to be perched on the halfway line. John Delaney asserted that the selling of these seats, along with the income from the stadium naming rights, would meet the FAI’s €74 million commitment to the development of the Aviva Stadium. Given that the IRFU sold their tickets at a flat rate of €15,000, and could bank on at least a couple of high-demand home games in the Six Nations and Autumn internationals that the FAI couldn’t, their pricing structure seemed ambitious at the time. Subsequent years have proven it to have been ludicrously – and damagingly – so. The seats didn’t sell, and consequently debts soared as high as €70 million. Delaney now says they are under control, standing at €29 million and on track to be fully cleared by 2020. At yesterday’s announcement, Delaney addressed the Vantage Club farrago before he was asked about it. It’s important to say that mistakes were made 10 years ago. The pricing was based on solid advice from major international bodies at the time. Pricing was wrong, obviously, as the recession began to bite. It also gives access to an annual Q&A with the Irish management team, but doesn’t include the tickets to the four Euro 2020 games to be held at the Aviva Stadium. The FAI are selling the tickets themselves: there is no third-party involved, as was the case at the outset of the Vantage Club Scheme with the inclusion of ISG. Delaney said the aim was to sell just short of 4,000 tickets, which would raise €12 million. That money, it seems, will largely go to servicing debt. “If we sell €12 million in tickets it will play a major part in reducing the debt. Delaney affirmed the FAI’s commitment to all levels of the game, saying that the FAI have invested €240 million at grassroots level over the last 10 years. It is tempting to speculate how much greater their investment might have been had they not been so hamstrung by loan repayments, however. In 2017, interest payments cost the FAI €1.6 million; the year before it was €4.25 million. In the meantime, the formation of national underage leagues at U13, U15, U17 and U19 level – widely seen as a critical step in improving the quality of player available at senior level – have not been matched with leagues at the intervening age groups, while League of Ireland prize money – which might encourage further investment into the development of players in Ireland – remains the same as it was in 2016. Mick McCarthy with assistants Robbie Keane and Terry Connor at the announcement of Club Ireland, a new FAI ticketing scheme. The failings of Ireland’s player development have been put on the agenda in recent years as the senior international team struggle, but as apathy toward the team has taken hold among the floating Irish sports fan, Delaney is confident that the FAI will shift the new premium tickets. In asserting this, he had cause once again to reference one of the ramifications of the 2008 mistake. “You are guaranteeing your ticket for 10 years and you know where you will be sitting”, said Delaney in defence of selling some tickets in 10-year bulks in spite of the widespread availability of tickets on a match-by-match basis over the last year. “For the big games – be it Germany, France or whoever – you can be sure that there will be huge games here over the next 10 years. “Also, there will be the investment back into Irish football. That’s the other side of it, we are continuing to grow the game. Email “FAI launch new ticket scheme in the shadow of 'mistakes' made 10 years ago”. Feedback on “FAI launch new ticket scheme in the shadow of 'mistakes' made 10 years ago”.